View of doorway leading to small enclosed courtyard. Once you've discovered the ideal site, finding the perfect house design can be a time-consuming and even frustrating process. But it all becomes worthwhile when the final plans take shape. Having obtained a lot with a commanding bay view, architect Charles Debbas set out to create a dwelling for his family that made the most of its location. Debbas says he took his inspiration from the site, incorporating the hillside, the city and the constantly changing light into the design. "The interplay of light is a dynamic element of the design. 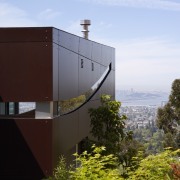 The house is two cubes, punctuated by daylight," Debbas says. "The way the house sits on its lot, it all comes together. The biggest asset is the dramatic view over the bay." 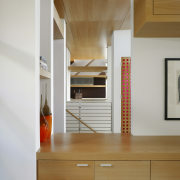 While the garage sits up high, contained in a concrete fiberboard cube, the main part of the house is below street level. Two sets of steps connect the upper and lower cubes. 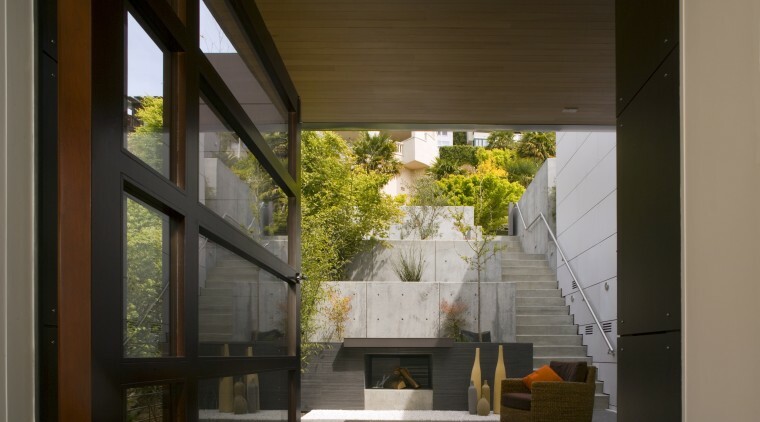 On one side of the garage, interior steps lead into the kitchen, while on the other side exterior concrete steps lead to an entry courtyard, complete with a fireplace. Next to the front door, a large glazed pivot door opens onto the courtyard, linking this area to the house's interior and the view beyond. The space allows friends and family to enjoy the fire while sheltered from the occasionally sharp winds that blow in from the bay, Debbas says. 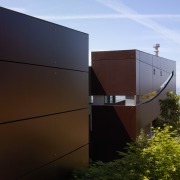 Materials that were both sustainable and low maintenance were specified for the exterior of the house. The cladding of the three-story lower cube looks like stained wood, but is actually resin fiberboard. This means an occasional power wash is all that is needed to keep it looking good. Ceramic slats are used on most of the decks, to reduce the amount of wood in the structure. Anodized aluminum trim matches the sliding doors on the western facade, which open to look out over the water. Inside the front door, a short hallway leads into the top-floor open-plan living area. To the right is a small study, while straight ahead is a seating area, next to the dining space, with the kitchen tucked in behind. The bedrooms are on the middle level while a family room and guest bedroom occupy the lowest level, which has access to a garden. 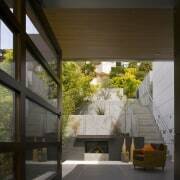 View of the small courtyard and concrete stairs leading to the garage. To make the most of the sprawling vista, glazed trifold doors were installed in the rooms overlooking the water. When the doors are opened, railings set just inside make each room into a balcony. "It's rare to have indoor-outdoor flow in a hillside house," Debbas says. "Here you open up the doors and you are one with everything." The shift in sunlight constantly redefines the character of the house. But the light that floods the house can be too much of a good thing. To prevent the rooms from becoming too hot or too bright, deep light shelves were fitted above the windows. In the summer, the shelves act as an overhang, keeping the rooms cool and reducing glare. The tops of the shelves are coated with anodized aluminum, so sunlight bounces onto the ceiling. This pushes light deep into the room to reduce the need for artificial light. In addition to these energy-saving features, the light shelves give structure to the scene and keep it fresh, says the architect. "When you look up, the shelves frame the clouds and the sunsets. 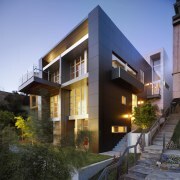 All along the west facade of the building, they continually offer different views," Debbas says. Interior colors and spaces were designed to be welcoming and cozy. Gentle browns, soft greens, shades of red and touches of fuchsia add warmth to cool white walls and pale wood. Arching over the top floor is a steamed beech ceiling, providing a contrast with the straight lines of the light shelves. 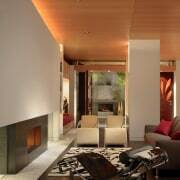 Negative detailing makes it appear as if the curved ceiling is floating. The arcing element is repeated in the wall above the fireplace, where the reveal hides a narrow sweeping window that is a feature on the exterior. "Once you're inside, you don't see the window, you only see the light," Debbas says. 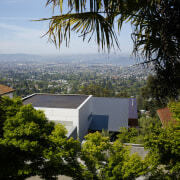 Exterior view of contemporary home with TRESPA siding, flat roof with corrugated iron, doors and windows and landscaping. 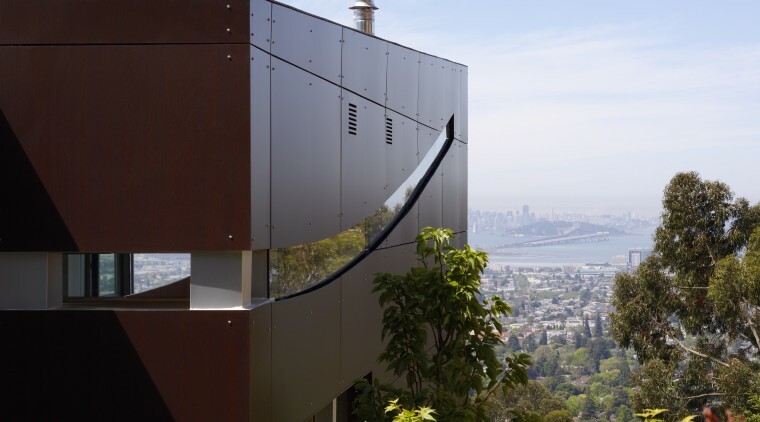 Because other houses on the hillside are set close by, the architect positioned the windows to let in light without overlooking the neighbors. A planter box on the north side was filled with horsetail to screen the window by the breakfast bar. To make preparing meals easier, the functional galley kitchen is filled with the biggest appliances the architect could find. The oven is three feet wide and the shallow, side-by-side refrigerator makes it simple to find food without hunting through other items. In keeping with the scale of the appliances, the sink is four feet long. The family-friendly room includes storage within the reach of small children, so they can get their own cups and plates. 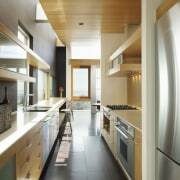 Pots and pans are stored in drawers underneath the stainless steel countertop. Making the most of the space, translucent panels above the cooktop both hide the range hood and provide a convenient place for spices. The backsplash behind the stove reflects a slice of family history a recipe handwritten by the architect's wife on a tiny piece of paper years ago. The words were enlarged, and then sandblasted onto a piece of glass, which was placed over an orange background. "It's a personal touch, and it's also very effective," Debbas says. The architect included a small balcony right next to the pantry specifically to hold a gas barbecue. This means the cook can easily access food and ingredients while enjoying the panoramic view.